Last nights Oscars made social media light up when Bradley Cooper and Lady Gaga performed ‘Shallow’ live. It wasn’t the great signing that got people talking, it was the chemistry between the two. The fact that they stared at each other so intently, rested their heads on each other and looked like they were about to kiss at the end but realized they were in public. When watching the two perform, it was magical. Undeniable chemistry. Then when you remember that Bradley has a girlfriend/baby mama and she’s sitting in the audience it takes an uncomfortable turn as you realize she must be sitting there and it hits her that her man is most likely having an affair. It was just like Brad Pitt and Angelina Jolie take the stage in front of his wife Jennifer Aniston. Don’t believe me, watch the video below. Kids are smart and know how to get exactly what they want! Check out the creative way this kid got his dad’s attention! Let’s be honest, I’ll probably never be able to afford a Tesla but if I could I would 100% be buying the car that has the new “Dog Mode”. This feature allows dog owners to leave their dog in the car with the air conditioning running, and the best part it displays the temperature on the window so people passing by do not get upset and call the police or start breaking windows. That way your furry friend can go with anywhere, and let’s be honest that just makes life better! Let’s be honest, true love is going to Olive Garden for dinner and your significant other doesn’t comment on how many of those hot delicious breadsticks you have and even lets you have the last one. Which makes Olive Gardens new thing basically the holy grail of Valentine’s Day gifts. 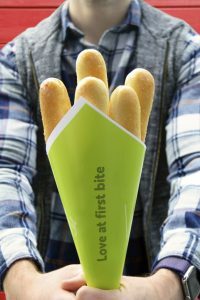 Introducing the OLIVE GARDEN BREADSTICK BOUQUET! All you have to do is print out and fold your bouquet container then head to Olive Garden for those delicious breadsticks. This picture is EVERYTHING that is Florida! 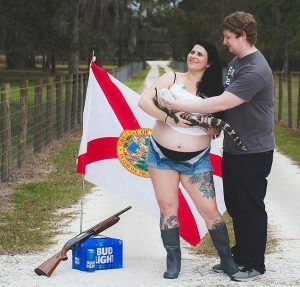 From the state flag, to the case of Bud Light, a shotgun, rain boots, cut-off shorts complete with them being unbuttoned and to just up the look a little…a baby alligator. I don’t think this family could have added anything else to make it more Florida.